monk kind of life, following the path of his hermit uncles who were living in solitary in the hermitage of Saint Antonius of Kozhayah, where they handed him the championship torch of virtues. His father passed away on August 8, 1831 in Gherfin, it is a village near AMCHIT, on his way back home after he was working in corvée for the Turkish Army, so his mother raised him as an orphan. Then she was married to Lahoud Ibrahim who became the priest of the parish, choosing the name ABDELAHAD. Youssef studied the principals of Arabic & Syriac in the school of the village. He was very pious, to the extent that his co-villagers used to call him the “Saint”. He used to take his small herd daily to the prairies and then he would go to a grotto where he would kneel in front of the Virgin Mary Icon and pray and so this grotto became his alter and his first hermit which became later a chapel for prayer and pilgrimage for believers. On the morning of one day in the year 1851, Youssef left his parents and his village. He headed for Lady of Mayfouk monastery in the aim of becoming a monk where he spent his first preparatory year and then he went to St. Maroun’s monastery-Annaya, where he joined the Corps of the Lebanese Maronite Order, choosing the name Charbel, one of the martyrs of the second century in the Antioch Church. On the first of November in the year 1853, he revealed his monastic vows in the same monastery. He was then well informed of the precise obligations of these vows: obeying, chastity & poverty. teacher the saint Nehemtallah Kassab Elhardiny, who was the ideal for the monks and a living image of the great Sanctified Monks in his private & public life. On July 23, 1859 Brother Charbel MAKHLOUF was ordained a priest in BKERKY, by putting the hand of the triple-merciful Archbishop Youssef ElMarid, Vicar of the Maronite Patriarchy. mass: “Father of righteousness, here is Your son a pleasing sacrifice!…” he would repeat as well the names of Jesus & Mary St Joseph and Peter & Paul the Patron Saints of the hermit. The spirit of St Charbel flew free, liberated going back to the dwelling of the Lord, just like the return of the drop of dew to the wider ocean, on the 24th of December 1898, on Christmas Eve. He was buried in the burial area of St Maroun’s Monastery- Annaya. After his death spiritual lights radiated from his tomb the reason for which his corpse which was perspiring sweat & blood; was transferred into a special coffin, after the permission of the Maronite patriarchate, and he was placed in a new tomb, inside the monastery. At that point groups of Pilgrims flocked soliciting his intercession. God blessed many of these by healing them and endowing them by other spiritual blessings. In the year 1925, a petition was raised to canonize him and declare his sanctity before his Beatitude Pope Bios XI, by father superior Ighnatious Dagher Tannoury, & his Vicar father Martinous Tarabay, where his plea was accepted as well as father Nehemtallah Kassab Elhardidni and Sister Rafca Elrayess in the year 1927. In 1950 the grave of St. Charbel was opened, in the presence of the Official Committee & Certified Doctors. They verified the wholeness of the corpse, and they wrote a medical report and put it in a box inside the coffin. All of a sudden, the healing happenings increased numerously & in an amazing way. Tens of thousands of pilgrims of different sects and rites flocked Annaya monastery requesting the intercession of the Saint. St. Charbel miracles surpassed the boarders of Lebanon, and the Letters and reports kept in St. Maroun’s Monastery – Annaya are lucid evidence on the widespread of his sanctity all over the world. 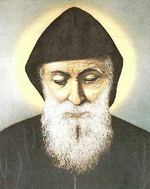 This unique phenomenon induced a comeback to good morals and a return to faith and a revival of virtues in the souls of people, and St Charbel Graveyard the center of attraction to all people of different social class and ages, and all became equal before him by prayers and piety, with no separation in religion or rite or sect. For him they are all called the Sons of God. But the curing registered in the records of St Maroun’s Monastery – Annaya achieved by God thru the intercession of Saint Cahrbel exceeds tens of thousands, excluding the healings widespread Worldwide to all colors, religions and sects, and these are not registered in the Monastery records. Ten percent on the curing were done to those not even baptized, and each cure was done in a different way, either by prayer and requesting intercession, or by oil & scent, or by the oak leaves of the hermit, or from the soil taken from his graveyard, or by visiting his grave and just touching the door of his tomb, or through his icon or statue. Some of these healings were on the physical level, but the most important is the spiritual healing of how many repentant returned to his God by the intercession of St. Charbel, just by the first step into the threshold of St. Maroun’s Monestary- Annaya or the hermit of St. Peter & Paul. The most important events in this period of time are the mystery of Incarnation, Passion, Death, and Resurrection of Jesus Christ, the Son of the Living God + Pentecost. -4 BC: Jesus Christ was born in Bethlehem. The most important events that happened in this period of time were the persecution of the Early Church, the spread of Christianity in the cities of the Roman Empire, especially Antioch, the martyrdom of the Apostles, and the victory of the Church over the Roman Empire with Constantine the Emperor. 37 AD: The martyrdom of St. Stephen. 44 AD: The martyrdom of St. James the apostle. 64 AD: Nero’s Persecution (St. Peter & St. Paul were martyred). 70 AD: the Temple of Jerusalem destroyed by the Romans. The Early Church was persecuted in Jerusalem. Those who had been scattered went as far as Phoenicia, Cyprus, and Antioch, preaching the word and proclaiming the Lord Jesus. The hand of the Lord was with them and a great number who believed turned to the Lord. It was in Antioch that the disciples were first called Christians. The heroes of this period were the Apostles and the Prophets. 110 AD: St Ignatius of Antioch was martyred. 156 AD: St Polycarp was martyred. 165 AD: St Justin was martyred. 237 AD: First church built in Syria. 250 AD: St Anthony the Great (the Monk) was born. (250-356 AD). 261 AD: The Persians burnt down Antioch. 313 AD: Edict of Milan. 324 AD: Constantine, the Emperor, wins over to the Christian Church. 325 AD: COUNCIL OF NICAEA. The heroes of this period were the Martyrs. There were at least 5 major persecutions (Domitian’s persecution, Septimus Severus’, Decius’, Valerian’s, and Diocletian’s persecutions). Because of the many heresies that arose in that period of time, especially Gnosticism, Marcionism, Montanism, Ebionism, Docetism, Adoptionism, Nazarianism, Donatism, and Arianism, the Holy Church organized herself appointing bishops to maintain the unity of belief and a moral life and presbyters to visit the sick, take care of the widows, orphans, and the poor, and to serve as judges. The most important events that happened in this period of time were the rise of monastic life (in Egypt & Antioch), the example of St. Maron, the end of Paganism in the Roman Empire, and the evangelization of the Phoenicians in Lebanon. 350 AD: St. John Chrysostom (350-407 AD) & St. Maron (350-410 AD) were born. 373 AD: St. Efrem died. 381 AD: COUNCIL OF CONSTANTINOPLE. 395 AD: The end of Paganism by Theodosius. 407 AD: St. John Chrysostom died. 410 AD: St. Maron died. 410-420 AD: The Phoenicians of Jebbet Bsharre and Jebbet Mnaytrah converted to Christianity through Abraham the hermit, the disciple of St Maron. 430 AD: St. Augustine died. 431 AD: COUNCIL OF EPHESUS. 432 AD: St. Patrick arrived in Ireland. 451 AD: COUNCIL OF CHALCEDON. 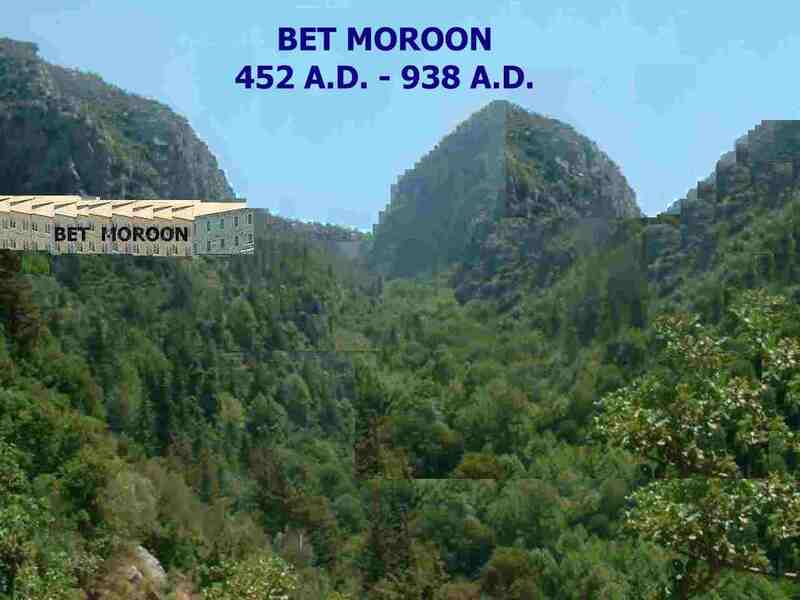 452 AD: The building of Bet Moroon. The heroes of this period were the monks and hermits who had to deny themselves, exercising the virtues of humility and chastity, serving their neighbors, giving testimony to the world. The most important events that happened in this period were the building and destruction of Bet Moroon, the persecution of the Maronites and their refuge in Lebanon, the end of the Roman Empire in the West, the conversion of the Germanic tribes in Europe, and the Arab invasion (including Antioch). 517 AD: 350 Maronite monks were killed by the Monophysites. The Maronites sent a letter to Pope Hormizdes. 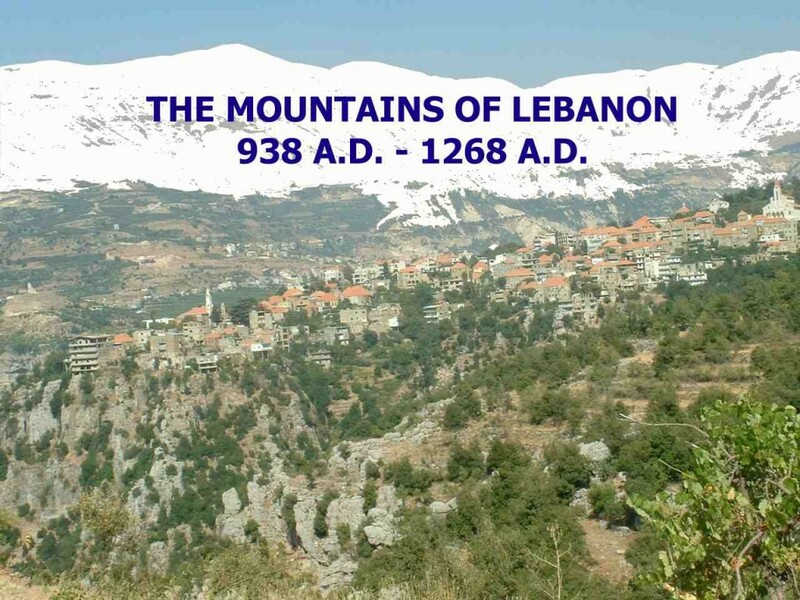 517-540 AD: Many Maronites took refuge in the mountains of Lebanon. 555 AD: Strong earthquakes destroyed Beirut and Antioch. 564 AD: The Persians invaded Syria & Palestine. 609 AD: The seat of Antioch is vacant. 614 AD: The Persians occupied Antioch. 624 AD: The Persians stole the Holy Cross. 632 AD: Arabia conquered by Islam. 636 AD: The Arabs invaded Syria and Palestine. 638 AD: The Arabs took control of Antioch. 694 AD: The byzantine Emperor destroyed Bet Moroon killing 500 Maronite monks. 712 AD: The Muslims converted the Church of St. John the Baptist-Damascus to a mosque. 739 AD: Yanouh (a village in Lebanon) became the Patriarchate seat. 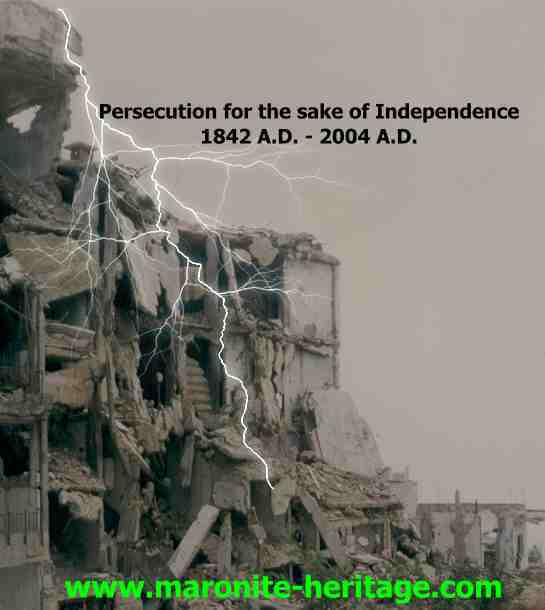 910-1009 AD: The Christians were persecuted in Syria and Palestine. 935 AD: The Turks took control over Syria and Palestine. 936 AD: The Church of the Sepulcre was burnt down in Jerusalem. 938 AD: Bet Moroon and many Maronite monasteries were completely destroyed. The Maronite Patriach Youhanna the Second left Syria to the mountains of Lebanon. The most important events that happened in this period were the schism between East & West, the persecution of Christians by the Arabs, the Crusades, and the Maronites’ relationship with the Pope & France. 938-969 AD: Many Maronites left Syria and took refuge in the mountains of Lebanon. 969 AD: The Byzantines took control over Antioch. 1009 AD: Thousands of churches were destroyed in Egypt, Syria and Palestine, and the Christians were forbidden to visit the Holy Land. 1048 AD: The Druze religion entered the mountains of Lebanon. 1054 AD: The Schism between the Eastern Church and the Latin Church. 1085 AD: The Turks took control over Antioch. 1099 AD: Crusades in Lebanon-Jerusalem. 1100 AD: The first Maronite contact with Rome. 1104 AD: The crusades took control over Byblos. 1109 AD: The crusades took control over Tripoli. 1131 AD: The Maronite spiritual leaders met the Papal mandate. They pledged to accept all the teachings of the Holy Father and to obey him. 1137 AD: Troubles between the Crusades and the Maronites. 1139 AD: The First meeting between the Maronites and the Mandate of the Holy See. 1145 – 1182 AD: The accident of Bezwash: Dogmatic schism between the Maronites of Bsharre and Rome. 1180 AD: The Maronites in obedience to Rome. 1182 AD: No more divisions between the Maronites of Bsharre and Rome. 1203 AD: The Second meeting between the Maronites and the Mandate of the Holy See. The Union with Rome was confirmed. 1215 AD: The FOURTH LATERAN COUNCIL. The Maronite Patriarch participated in the Council. The most important events that happened in this period of time were the Mamlooks’ persecution, the black death, the fall of Constantinople, and the discovery of America. 1268 AD: The Mamlooks State began. The Mamlooks launched their first offensive against the Maronites of Bsharre. 1281 AD: The Mamlooks sowed destruction in the Maronite villages. They killed the Patriarch. 1283 AD: The Second Mamlook offensive against the Maronites. 1291 AD: The first Mamlook offensive against Kesrwan. 1300 AD: The second Mamlook offensive against Kesrwan. 1305 AD: The Mamlooks destroyed Kesrwan, killing 10,000 people. 1308 AD: The Pope moved to Avignon. 1439 AD: COUNCIL OF FLORANCE. 1440 AD: The Mamlooks sowed destruction in Miefook. The Maronite Patriarch moved his seat to the Valley of Qannoubeen. 1457 AD: St. Rita died. 1475 AD: The first 2 Maronite monks were sent to Rome to study. 1488 AD: The Maronites of Bsharre drove the Jacobites out of Jebbet Bsharre using force. The most important events that happened in this period were the schism in the West (Catholic Church & Protestants), the French protection of the Maronites, the Lebanese territories under one Emirate, the opening of schools & religious orders in Lebanon, and the Lebanese Synod. 1516 AD: The Ottoman rule. 1517 AD: Debate of Martin Luther (95 theses). 1521 AD: The formal excommunication of Martin Luther. 1524 – 1568 AD: The Maronites expanded in Lebanon and built Kesrwan. 1541 AD: The Church of Geneva by Calvin. 1550 AD: The Maronites were granted freedom of worship by the Ottomans through the French Ambassador. 1555 AD: The peace of Augsburg that gave rights to protestants. 1570 AD: The Ottomans invaded Cyprus killing a great number of Maronites. 1571 AD: The Ottomans conquered Armenia & Cyprus. The Battle of Lepanto. 1582 AD: St. Theresa of Avila died. 1584 AD: The Ottomans killed 60,000 Druze. 1584 AD: Pope Gregorius XIII founded the Maronite College in Rome. 1623 AD: The Lebanese territories are united under one Emirate with Fakhr Ed-Din II. 1626 AD: The Cappucins arrived in Lebanon. 1633 AD: Fakhr Ed-Din II prepared the Lebanese Constitution. 1635 AD: The Ottomans killed Fakhr Ed-Din II. 1635 AD: The Carmelites arrived in Lebanon. 1648 AD: The end of religious wars in Europe. 1656 AD: The Jesuits arrived in Lebanon. 1683 AD: The Turks were defeated in Vienna. The month of May was consecrated to Mary. 1695 AD: On November 10, 1695, three Alepine young men: Gebrayel Hawwa, Abdallah Karaaly & Youssef El-Bitin founded the Maronite Alepine Order. 1704 AD: Patriarch Stephen Dwaihy died. 1710 AD: The Chehabs (who were Druze) became Maronites. 1732 AD: The Druze Emir Melhem Abi Haidar became Maronite. 1733 AD: The School of Aintoura. 1734 AD: The School of Zghorta. 1734-1735 AD: The Lebanese Synod. 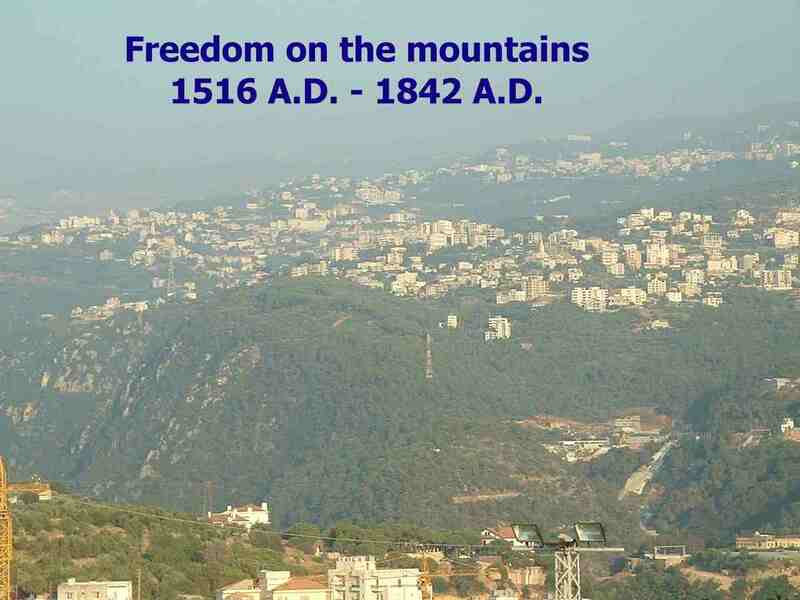 1754 AD: The Emir Youssef was proclaimed a Christian Emir over the Mountains of Lebanon. 1770 AD: The Maronite Order was divided into two separate Orders: The Maronite Alepine Order & the Maronite Baladite (National) Order. 1771 AD: The Maronites expelled the Hamadites (Shiites) out of Jebbet. 1792 AD: The School of Ain Warqa. 1799 AD: Napoleon Bonaparte entered Palestine. 1818 AD: The School of St. Maron Kfarhay. 1821 AD: The Muslims of Beirut persecuted the Christians. They converted the Church of St. John the Baptist into a mosque. 1830 AD: More schools in Lebanon: School of Mar Abda. 1832 AD: School of Rayfoun. 1840 AD: The Lebanese (Maronites and Druze) rebelled against the Egyptian occupier. The most important events that happened in this period were the persecution of the Maronites in Lebanon (Genocide + Famine), the World Wars & the War on Terror, and the independence of Lebanon & his neighbors’ occupation of Lebanese territories. 1842 AD: Tensions between the Maronites and the Druze incited by the Ottomans. 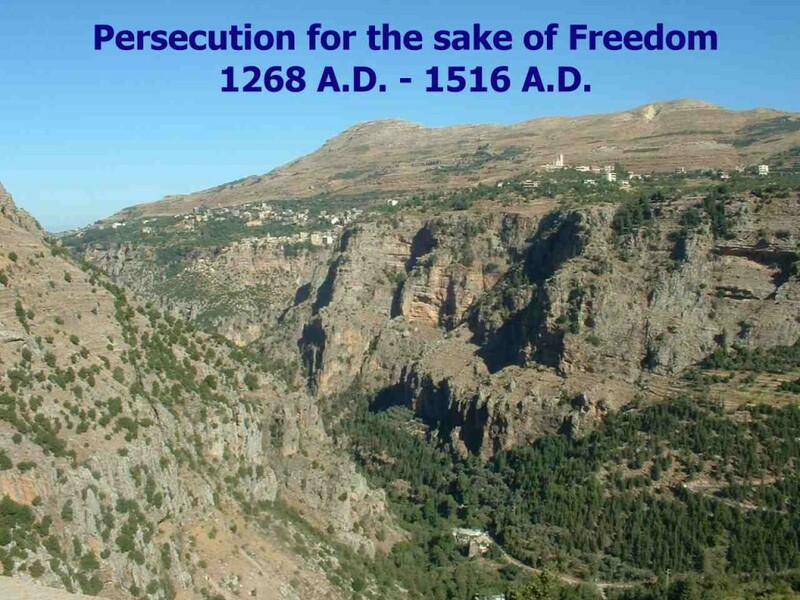 1845 AD: The Druze attack the Maronite villages killing hundreds of people. 1858 AD: The Virgin Mary appears in Lourdes. 1858 AD: St. Nimatullah Hardini dies. 1860 AD: The Massacres of 1860. 10,000 Maronites are martyred. Blessed Masabki brothers are martyred in Damascus. 1861 AD: Thousands of young Maronites emigrate to the Americas especially to Brazil, Mexico, and the USA. 1897 AD: St. Teresa of Lisieux dies. 1898 AD: St. Sharbel dies. 1914 – 1918 AD: The First World War. 1914 AD: St. Rafqa dies. 1915 -1918 AD: The Great Famine in the mountains. One third of the Maronites perish. Thousands of families emigrate to the Americas, especially the USA. 1917 AD: The Virgin Mary appears in Fatima. 1918 AD: The fall of the Ottoman Empire. Lebanon becomes under the French delegate. 1920 AD: The Patriarch Howayek and the Peace Conference of Versailles. The Patriarch requests the independence of Lebanon. 1939-1945 AD: The Second World War. 1943 AD: Lebanon wins its independence. 1948 AD: The State of Israel. 1960 AD: 400,000 Maronites reside in Lebanon. 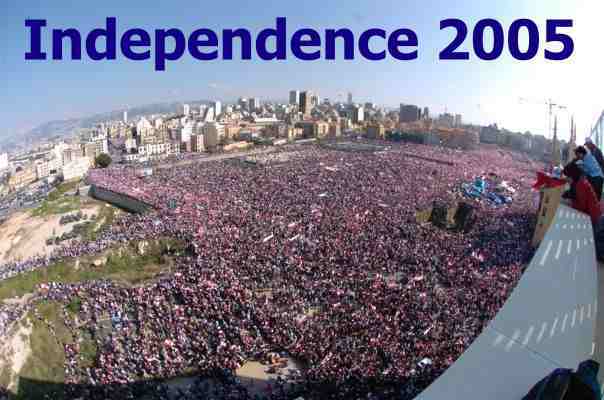 700,000 outside Lebanon. 1975 – 1990 AD: The War in Lebanon. Lebanon falls under Israeli and Syrian Baathist Occupation. 1977 AD: Sharbel Makhlouf is canonized. 1981 AD: The War of Zahle & Beirut. 1983-1985 AD: Massacres in the mountains. 1989 AD: The War for liberation. 1990 AD: The Maronites become divided. They lose their independence. Tens of thousands of young people and families emigrate especially to Canada, Australia, USA, and Europe. Lebanon becomes under Baathist tutelage. 1991 AD: The First Gulf War. Synod for Lebanon. 1994 AD: The Christians of Lebanon are marginalized. 1997 AD: Pope John Paul II visits Lebanon and gives hope to the Maronites. 1998 AD: Nimatullah Hardini is beatified. 2001 AD: The Patriarch’s visit to the USA. 300,000 Maronites welcome him in Lebanon. Rafqa is canonized. The Patriarch visits the Druze for reconciliation. The Pro-Syrian government responds with more oppression. 2001 AD: September 11. The War on Terror. 2003-2004 AD: The Maronite Synod. The Second Gulf War. 2004 AD: Nimatullah Hardini is canonized. The Patriarch’s Fifth Appeal. UN Resolution 1559. 2005 AD: The Cedar Revolution. The largest demonstration in Lebanon’s History. The Syrian Baathist Regime withdraws from Lebanon under international pressure. Lebanon becomes free of Occupation on April 26, 2005. 2010: Brother Estephan Nehme, a Maronite monk, was beatified on June 27, 2010.